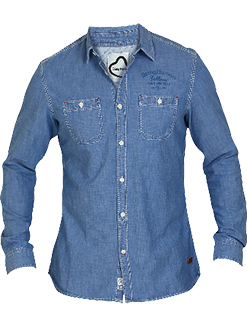 This summer, Being Human Clothing introduces the biggest trend of the season – Denim Fever - the range includes ultra-soft washed denim shirts in light weight fabrics and light jeans, to beat the heat in style. Leaving behind winter’s dominating dark hues; this season denim is dominating like never before. The ‘blue deeper than indigo’ collection of denim wear range by Being Human Clothing is available in multiple wash options and designs. Humble shirts in every shade of blue, roll up sleeves shirt, t-shirts with denim detailing, printed shorts and much more, this collection feeds your every need for summery denim look. Jeans for men and women is one of Being Human Clothing’s most loved products and this season it is available in completely washed out and distressed versions to crisp raw wash options; there is something for everyone with multiple fit options. Ditch the dark hues for the light shades of denims this summer and if dark is your choice you can still indulge in some extravagant options at Being Human Clothing. Team up our stylish and new “boyfriend fit” denims with a cool pin-stripped shirt to have your spring days covered. And don’t forget to roll up the legs; just to add some nonchalance. The collection can be styled in any look you prefer! From denim on denim to a humble t-shirt inside your denim shirt, you can experiment this trendy fabric with any style you like. Sport a formal look or head out for an evening of fun, or just have a relaxed sunny day. Keep it clean with a pair of undamaged dark jeans for Fridays at work or an evening soiree. Our Spring Summer 14 collection has got your denim wardrobe covered this season. So get ready to indulge yourself in denim goodness from head to toe! PANACHEAs it’s rightly said, a woman is the full circle.